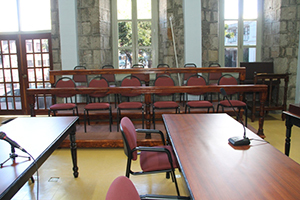 NIA CHARLESTOWN NEVIS (November 12, 2014) — The Nevis Island Administration (NIA) came in for high praise from Resident Judge in the Eastern Caribbean Supreme Court, Nevis Circuit Justice Lorraine Williams, for the refurbished courtroom at the High Court in Charlestown. 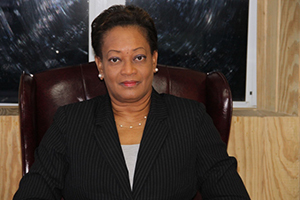 Justice Williams registered her thanks when she gave welcome remarks, moments before the formal opening of the November Assizes in Nevis on November 10, 2014. “I would like to welcome everyone back to our spanking newly refurbished and aesthetically pleasing courtroom. From the onset, I would like to thank the Almighty God for his divine intervention in seeing this project to completion. 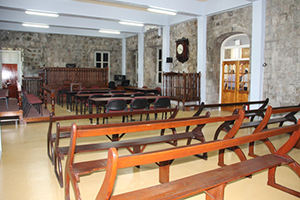 I would like to express my profound gratitude to the Government of St. Kitts and Nevis and in particular, the Nevis Island Government for the support, assistance and resources provided to this project for modernizing this court. “In particular, I extend my thanks and appreciation to the Hon. Vance Amory, Premier of Nevis and members of his Cabinet, Mr. [Collin] Tyrell, Mr. [Troy] Liburd,” she said. Justice Williams also thanked Queen’s Counsel Theodor Hobson for what she described as his special interest and support for the refurbishment of the courtroom. The Resident Judge also thanked Director of Public Works Deora Pemberton and Supervisor of Buildings Alistair Thompson and other workers from the Public Works Department, who she said went well beyond the call of duty in the project and embraced the vision and shared their ideas and expertise. Judge Williams also expressed gratitude to others who contributed to the project. “To Mr. Hewlett, the carpenter who created this a work of art that I sit on, this elegant dais, witness box and accused dock and all the bar table refurbishments. The electricians, the private contractors, the tile and carpet layers, the men who made the jury stand, thanks for a job well done! “To Mr. [Quincy] Prentice, Mr. [Geran] Browne and Mr. Anderson [Henry] who came up from St. Lucia and all the IT crew, thanks for your professionalism in hooking us up so that we are digitally recorded and we can hear each other now with our new audio system. We look forward to obtaining the new video conference system soon to complete our modernization,” she said. The Judge also showed appreciation to staff of the Registry in particular Ms. Yasmin Clarke, Vanella Nisbett, John Arthurton and Darnel Morton for their patience, support and assistance. “I know this was a difficult period for you with the dust, noise and the general inconvenience of the repairs. 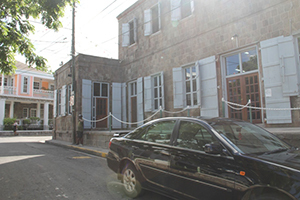 I am confident that phase 2 for the refurbishments will be in the adequate space you now occupy and that you will enjoy better conditions of work in the near future which you richly deserve,” she said to the Registry workers. Judge Williams also used the opportunity to thank members of the Bar who came to the opening of the Assizes. “I also want to express gratitude to all members of the Bar who turned out here this morning in such large numbers. Your presence here speaks volumes for this opening of the Assizes. Also I want to express my special thanks to Mr. Jeffrey Nisbett for his generosity,” she said. The High Court Judge also had some words of advice for members of the Bar and public. “I am hopeful that all members of the Bar and the public in general, will appreciate what has been done here and that everyone will exercise their duty of care, in taking care of and preserving the Hall of Justice here. This is the people’s court. Let us all play our part in ensuring that the last bastion of democracy is preserved and honoured,” she said.